Regardless of who you are voting for, don’t forget to vote. Most people just vote for president, but there are local elections most places also. Your local elections probably have the largest impact on you, and where you have the largest impact yourself. 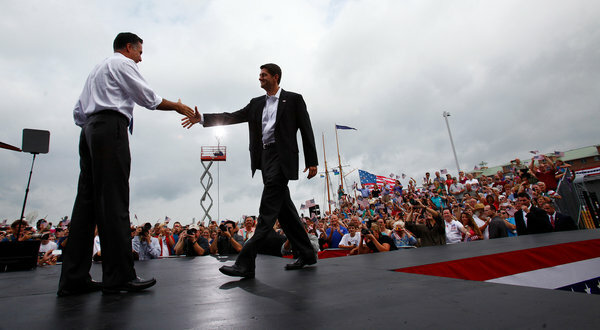 I’m very excited about Mitt Romney adding Paul Ryan to the Republican ticket for the 2012 presidential election. The reason is that with all of the debate going on in the country Paul Ryan has put forward a budget with specifics that is a concrete manifestation of their view of government. It gives us something to talk about other than a string of abstract platitudes regarding what government should be. We can argue whether government should be big or small, but each vision has consequences. The Ryan budget lays it out. Now, I would love it if Barak Obama would also put forth a similar budget. Something specific. Something that we can compare side-by-side. The fact that the Democrats haven’t even passed a budget in the past 3 years is a travesty in its own right. We can have a real debate about what we would like this country to be like. I’m excited about this because with the Ryan budget we can really battle it out, over specifics about what it means. Hopefully, we can all decide what we want in this election, and have our debate, and then who ever wins – wins. Perhaps then, instead of muddling around, we can move forward on some path. With the start of the new year, I’ve been thinking about what may be in store for us. To start, one which could be foreseen and long rumored, was the bankruptcy filing of Kodak. This already happened on January 19th. What does it mean? For starters, I suppose that you can now say that film based photography is officially dead. Secondly, the talk about the auction of a portion of their imaging patents wasn’t able to hold off the bankruptcy filing. The tech patent market seems to have become pretty quiet over the second half of the past year, and will probably continue to do so. Another company that looks to be headed into a dismal abyss this year is Research in Motion (RIM). RIM puts out the Blackberry phones. They’ve had a plummeting share in the US smartphone market to about 9%, down from 24% at the start of 2011. In addition to that, they have delayed the release of their new operating system QNX to late in the year. With how fast the mobile market is changing, that may be too late for them. Moving on in the technology sector, Apple will release their rumored Apple TV, but my sense is that this will probably have a much harder time than the previous products that they have been releasing such as the iPhone and iPad. (Apple is sitting on a mountain of cash so they have the ability to keep it around till it gains sufficient traction.) The TV market is so established by now, that they would have to come up with something significantly revolutionary to make significant inroads. The tablet market was in such infancy, and in the smartphone market the iPhone was so far ahead of anything else that both had no significant competition. The tablet market will continue to be dominated by the iPad, but Android will make significant gains in the smartphone market. The big difference here being the carrier subsidies. Unless the android tablets came significantly undercut the iPad on price, they will had difficulty competing. For two tablets that cost about the same price, the choice will be the iPad over an Android competitor. The cloud will continue to grow in the services that it provides, and mobile networking and social media will continue to drive social and political turmoil around the world. Facebook will go public to the dismay (or delight depending on if you’re buying or selling) the Valley’s property market, but with a significantly small number of shares floated. I don’t see Mark Zuckerberg wanting to give up that much control. In other news, the Nissan Leaf will usher in the era of the electric car in the same manner that the Toyota Prius created the market for the hybrid. However, the electric car will be limited to two car families with a usable garage limiting the usable market for it. Without a reliable place to plug the car in for the night, it’s just not that useful and the range prevents it from being used for anything other than daily commuting. What about the Euro? Two things can happen. Either the countries get it together or it falls apart. The European governments will stumble through the year, but in the end it probably won’t make it through the year as it currently is. At least one country (Greece) get’s thrown out of the currency. This is the more likely scenario compared to a complete collapse of the common currency. At some point, an organized exit may be seen as the only politically viable solution as opposed to more political integration of the European countries. In Russia the protests will turn more violent, but Vladimir Putin will return as President of Russia, but not without political unrest and charges of rigging the election by the world at large. President Bashar al-Assad of Syria will be toppled. More covert and possibly military action will take place against Iran’s nuclear program, but not an outright war. Barak Obama will narrowly win the election and serve a second term as President. The stock market will be either flat or down on the news. If he loses the election, the stock market will rise on the news hoping that a change in office will be a fresh start and the economic climate will brighten. Any change will be better than the current path that the economy is on. What else? This site will get a new look this year. The camera will get dusted off and pulled out of the closet. The Patriots will win the Super Bowl and have their revenge. The news came out after-hours last night that Steve Jobs is stepping down as CEO of Apple effective immediately. This was the day that I think most shareholders have dreaded for quite some time. I don’t think that there will be any noticeable change in the near-term. Products are already being developed, and the company seems to have a roadmap in place for the next few years that, if history is any indication, will leave competitors struggling to keep up. Out past that, I think that it may be more uncertain. Steve Jobs has a great talent. He has been able to see into the future and create beautiful products that people want. The question of if that will continue is what will be answered but not for a few years. Fundamentally, Steve Jobs has taken the old computer retailer and created a new company that packages technology in a simple, elegant, easy and intuitive package for people to use. Basically, it trades on the power of ideas. Anyone can sell computers, but selling ideas is harder, and almost impossible to copy. A company can sell ideas forever, long after computers have become obsolete. Whether it can continue to innovate after the main wellspring has gone is the question.